Top 8 Project Management Methodologies: Which One Is Right For You? This is an exciting time to be investigating project management methodologies. Why? The methods are rapidly changing, morphing into hybrid methods and bringing lots of new ideas to the table. There’s been more interest in project management methodologies as more cross-functional teams are working, collaborating and investigating different ways to work. Project teams are combining the different styles, coming up with new combinations, discovering new benefits and even using personal productivity styles and systems to help with projects. Here are some of the most popular project management methods and how you can use them with ClickUp. Most people don’t use a methodology or a systematic way of looking at their projects. Or they use what I call the “hurdle” method. But people don’t want to admit to not having a plan, so I’ll coin a term for you: hurdle project management. Think of track and field and hurdles. With hurdles, you’re running as fast as you can and jumping as high as you can, hoping you never trip. But if you do, your race is over. A lot of people manage their projects that way. Hurdle project management is when you see tasks in front of you and jump as high as you can. This is where most people just have a bunch of random tasks and hope they jump over it to the next one. There is no clarification on what’s important, what needs to be done next and so on. The strategy used is a random hodgepodge of urgent emails, failed presentations and musings from the boss’ backyard barbecue. That’s not a project management methodology — that’s jumping over whatever is in front of you. Buildings can’t be built that way. Neither can cars. Companies in charge of these complex projects require precision, coordination, and speed. But wait. You don’t have to build skyscrapers to want those things in your business! So if you don’t use anything or feel yourself constantly scaling hurdles, then it’s time to use ClickUp. With an easy-to-use hierarchy, ClickUp is customizable and flexible enough to use whatever methodology works best for your team. From waterfall, to agile and everything in between, ClickUp can be customized to meet your needs. Take a look at the methodologies below and contact us help@clickup.com if you have any questions. Now, let’s dive into the actual project management methodologies that have been used for a long time. The waterfall methodology is a sequential, linear model where each piece of the project builds on the next. One thing has to be completed before the next. There was a time where only dedicated project managers were in charge of putting all of this together. That’s no longer the case, especially as more digital tools have emerged. 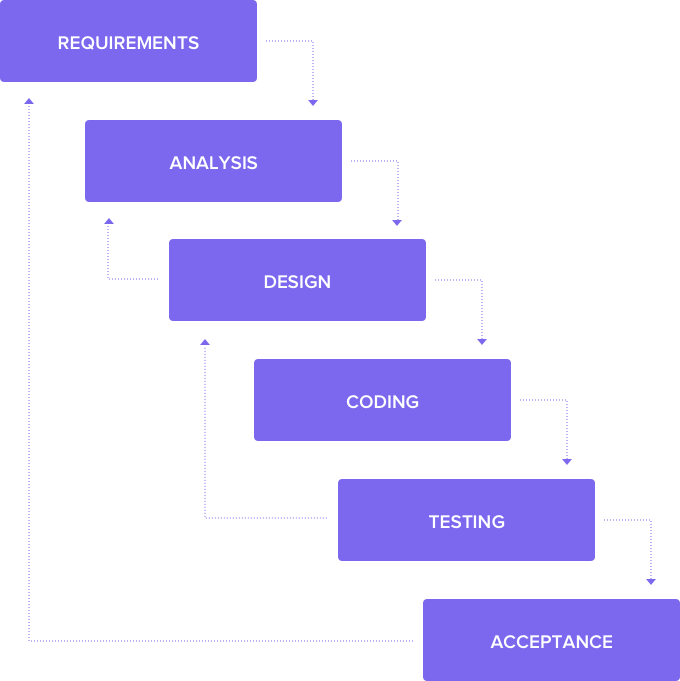 The Waterfall Methodology was originally described by Dr. Winston Royce in 1970 as a way to think about software development and the software development life cycle (SDLC). As software systems became more complex, it was important to think about how they would be developed. Initially, it was enough to do an analysis of the problem and then start coding. But as software became more advanced and increased in functionality and needed to respond to several different environments, this was no longer feasible. System/Software Requirements: This is the first phase of the waterfall process. A project manager will work with the product manager, product owner and key stakeholders (such as the client) to record all of the potential requirements and specs to make the product a success. This is the requirements document. It will clearly outline what the application should do, but not necessarily the steps to do it. Analysis: During this second stage, the system is analyzed in order to properly generate the models and business logic that will be used in the application. In the analysis phase, the requirements doc is reviewed by stakeholders and the project manager to ensure it fulfills the business case, meets the budget and manages risk. This is where you would formalize your project plan (if needed) for deliverables, resource and budget. Design: What will your software look like? This is the time to design and wireframe mockups with your design tools. It’s time to review and think about the technical design, the preferred programming language, API connectivity and more. You’re taking the requirements and making them real for how they’ll actually be implemented. You’ll probably choose which team members are working on what during this stage. Coding: Now you’re doing the work. Each team member knows what section they’re responsible for and when they need to be finished. They’ll work on creating the mockups and implementing any new connections that need to be made. Testing: This is the QA stage where testers will try out the product to see if it works or not and meets the specs and requirements. Many companies have dedicated QA analysts who look for bugs and other hiccups in the code. The QA team may send a particular feature back for more work to the coders to have something fixed or elevate it to a lead engineer. Code is usually tested in a staging environment. Acceptance: Congrats! The software is deployed to a live environment for the stakeholders, clients or customers. Finally, the application is ready for deployment to a live environment. Operations or DevOps may take over from here for any ongoing maintenance of the code once the initial work has been done. Pros: It’s easy to use and straightforward. There aren’t as many moving parts, even though each section can have breakdowns (or sub-projects and subtasks) before moving on to the next section. You can check the box before moving on to the next phase. Because of the rigidity, scope creep becomes less of an issue. Cons: Inflexible if requirements change or if the initial pre-work is done improperly. If you have a new software feature you’re developing, start by creating a new project. Name it after what the final deliverable will be. B. Set up lists for each stage of the waterfall method. If you’re following the stages that are listed above, you’ll want to create a list for each stage. That would include Requirements (and or Specs), Analysis, Design, Coding, QA/Testing and Production. With list details, you can give additional information each stage, add important attachments and set due dates. You could also set up custom statuses for each project. These statuses are available only on tasks and lists for that specific project. This helps you establish different workflows for different parts of your project, customizing to the needs of those teams and workers. C. Create tasks under each list. For your Requirements, this could include tasks for research, talking to stakeholders, budget estimates, resource allocation and more. 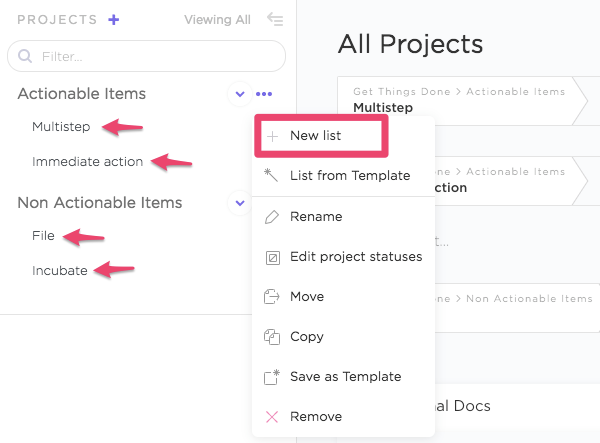 You may want to create tasks for all lists at once, or ask individual project managers to own part of the list and create their own tasks. D. Refine and customize tasks. This is where ClickUp really shines. For a successful project, you’ll want to create custom statuses, set start and due dates and add dependencies so one task doesn’t start until another is finished. You can also create subtasks within tasks if you have a special focus that needs more attention. The Waterfall model will be successful with a program like ClickUp. What is agile? Agile development is a project management methodology that involves the customer in the development process. A lot of firms are now using agile methodology to help them with software development–because it’s flexible. Agile helps them react within the system rather than trying to obtain fixed goals that may no longer be relevant as the project moves along. An iterative process helps them do this, as project goals and objectives are re-evaluated in this process to move the project forward. This is a key part of agile project development. Rather than have one major software release at the end of six months or longer (which is the case with traditional project management), there are multiple releases every one or two weeks. Teams work in sprints to build these releases. Individuals and interactions over tools and processes. Team communication and maintaining the right relationships is more important than strictly following the process. The team has a goal in mind, but could arrive there in a new or faster way. Working software over detailed documentation. In other words, it’s more important to have a product than to just talk about a product. Collaborating customers over contract negotiation. In a waterfall scenario, the customer or stakeholders are involved in the beginning and in the end, but not during the process. Demos or a potential end user from the client could be present to ensure that business needs are met and that the product will do what the client needs. Respond to change over implementing a plan. Short iterations allow for more flexibility and change. New features or enhancements can be added faster if there’s room for it, even if it wasn’t in the original documentation. You can see just from that short description that much of what drives agile is the work itself rather than a plan from an outside project manager or stakeholder that isn’t actually doing the work. Instead of a formal project manager, the product manager may submit the requirements to different teams and then let them gobble up different parts of it while making adjustments based on the sprints. Many agile project management teams use kanban cards or boards as their project management system, noting work that needs to be done, work in progress and finished work. ClickUp has a board view, where you can drag and drop tasks from different statuses and review. Pros: Agile puts the customer first, is adaptable to changing needs and allows teams to put out an MVP before moving on to the next project. Cons: There’s often not a clear end to the project, especially if everything is iterative. Sprints can help with that, though it’s not always the perfect solution. Also, documentation is usually sparse because things are changing rapidly and the scope is always refined. This can make it difficult for new hires to get up to speed. Sometimes the stakeholders or final client has too much say in the process–slowing down advancements. A. Set up projects for the product you’re developing. Projects will serve as categories for different parts of your product development. For example, at ClickUp we have Android, iOS, Frontend, Backend, etc Projects in our development Space. Projects organize your Spaces and contain Lists and tasks. This is where Sprints are hosted. Each List should represent an individual sprint with an additional List titled “Backlog”. New features and aspects of a product will be developed within these Lists and archived when completed. Lists function perfectly as sprints, since each List can hold many tasks as apply to it. Also, Lists can have start/due dates, details, an entire activity thread, and so much more! In ClickUp, the Board View is the go-to vehicle for day-to-day tasks of the scrum process which operates like a Kanban board. However, sometimes you’ll also need a big-picture perspective. For ClickUp users, this need is addressed with the Box View – our way of organizing your project into stats and highlights that are easy to consume and highly informative. Tasks are the specific action steps that need to happen next. That is what will populate each Sprint (List). For each sprint to be pushed into production, each of its tasks should be completed as well. Tasks that need to be pushed into the next sprint can be easily moved. You can also customize statuses, start dates, end dates and more for your agile workflow, and even integrate with Github. For more details on how to set up agile within ClickUp, check out this help doc. Custom statuses is an essential component of the Scrum methodology. But don’t worry, we’ve already set up custom statuses for you to use. Go to settings, Spaces and then under “Custom Statuses” click “Scrum” to access our already pre-formatted statuses for this workflow. For more details on how to set up Agile and Scrum in ClickUp, check out this help doc. And if for your personal tasks in Scrum, use the notepad to jot down your next action items. How can you combine the best of both worlds? With Structured Agile. This approach allows you to gather all of your requirements up front (and stick with them) while then iterating in the process. You still get the documentation tracking with a flexible framework. With this hybrid, you can add user stories to the development cycle, but keep the planning and framework. Here’s a great breakdown of the hybrid or “Agifall” method. Cons: Team members may skew towards waterfall or agile, so elaborating on the specifics for your team is paramount. Scrum is a version of agile, but often there is no project manager and teams are self-organized. Daily standups and short sprints are the hallmark of scrum, even though sometimes there is a scrum master that serves as a de facto project manager. This often looks different at each organization that implements it. A strict scrum approach will have 30-day sprints to finish different segments of the project. The Scrum methodology utilizes Sprints, where work (specifically backlog development) is divided into sections–such as weeks or months. The next work Sprint is a dedicated amount of time to finish a specific feature and all resources are dedicated to it. Each Sprint ends with a retrospective or sprint review, where teams get together and decide next steps and discuss how the work progressed. Pros: Scrum teams often have clear insight into the project status–meaning they can accurately judge risks and roadblocks and budget issues that may hold it back. Cons: Who’s in charge? That’s always the problem with scrum and why a scrum master may end up with more responsibility than they thought they would. There’s also a greater possibility for failure because of the uncertainty of the teams. They may not have a full picture of the project scope or resources because they are doing the work and managing development projects, too. Like a good map? That’s essentially what Critical Path is. It’s a roadmap that shows you where and how things need to get done, and how those projects potentially overlap. Lots of project management software programs have critical path built in, showing you the fastest way forward. This method places tasks sequentially and then helps you build out a structure from there. It can be shown in a flow chart or in a Gantt chart and helps you estimate the time it will take to finish. This is a great guide on the Critical Path Method if you’re looking for even more information. Not to be confused with Critical Chain project management, which is a resource-focused analysis of what is left to finish the tasks. The Critical Path method focuses on the tasks themselves. Pros: Critical path highlights which tasks are most at risk for falling behind. It’s also great for comparing your estimated timeline versus where you actually stand. Cons: If you’re a rookie project manager without much planning experience, the Critical Path Method could derail you. If you underestimate your time it may put the whole project in danger. GTD isn’t a “real” project management methodology, but tell that to the people who swear by it. Instead, it’s a personal productivity system made by famous by David Allen, the writer of Get Things Done. It’s become a whole way of life for many people, giving them a clear method to prioritize their tasks and work. “Priority” is the key word because the GTD methodology is great at helping you (and your team) make decisions about what needs to be done next. Most project management methodologies are very systematic in nature, but they don’t account for if you are involved in multiple projects at once which is the problem that many non-technical workers face in business development, marketing, HR and more. To that end, the GTD method helps you close any “open loops,” meaning those big ideas that have been lingering around but that you don’t have any actionable steps to account for. The good news is that you can set up ClickUp specifically to help with each of those five areas. NOTE: Check out more here on how to set up GTD in ClickUp. An organized and controlled start. Know what you’re getting into. Pros: Clear roles and responsibilities among all team members. A project manager reports to a project board which makes the final call on any issues that may arise. Cons: This is a different spin on the waterfall approach, but it has more precise processes and terminologies. To that end, you could take principles of PRINCE2 without actually practicing PRINCE2. 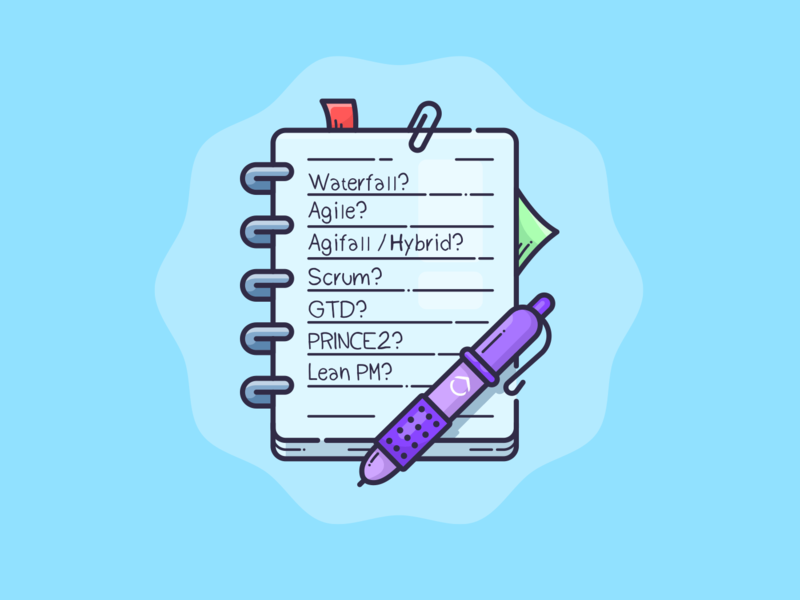 Lean is thought of as the forebear to agile project management, but there are some definite differences. Lean puts an emphasis on discarding waste and emphasizing efficiency and is made famous by the Kanban board. There are 3 M’s to Lean, and it was first developed at Toyota plants in Japan. Mura: Nothing should be waiting. The right amount should be made and available. Pros: Statuses are known across the organization because of the Kanban board approach. Everyone and their role is accounted for. Cons: A high emphasis on Lean may discount individual expertise and skill-sets. Which project methodology is right for you? That’s a trick question. Because what’s happening across every industry is rapid innovation with an emphasis on faster, more efficient-driven development. But the benefits will differ between industries. Tesla may be employing Lean Six Sigma (a type of process improvement) without even knowing it. But a manufacturing plant, like Toyota or Tesla, is way different than a marketing campaign. But sometimes the principles do apply, which is why you get the Lean Startup or Agile Marketing. Those don’t have to be only buzzwords, but real actionable tips to help you get more done.